How to connect Batch to Google Analytics? 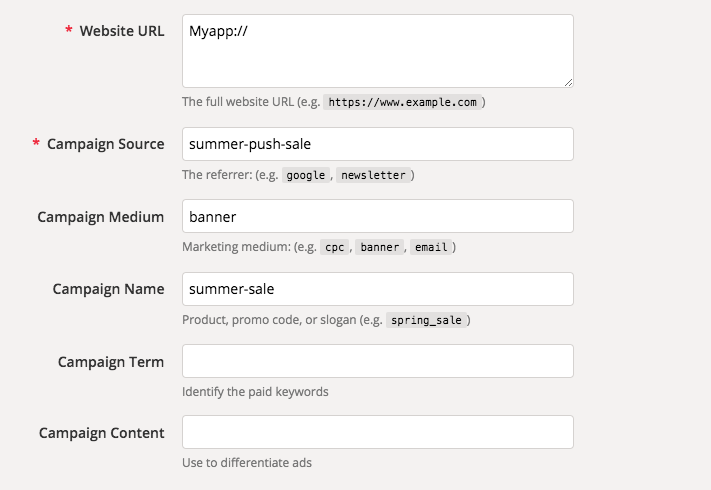 You can add UTM tags to your deeplinks to track users who open your push notifications using Google Analytics. Batch allows you to track in Google Analytics users who open your push notifications. This is helpful to understand what your users do in your app, track transactions and e-commerce conversions. Note : This article assumes you are already using the V3 of Google Analytics' SDK in your app. Also, you must have a deeplink architecture integrated in your application. Campaign Name (utm_campaign): This can be the name (e.g. salejuly) or the category of your push campaign (e.g. onboarding). On Google Analytics, you will be able to track users coming from specific sources, medium or campaigns by going to Acquisition > Sources > all . Then you will be able to see your whole campaigns from push notification by clicking on campaign tab.